Houston, TX -- The American Medical Association (AMA) voted today to reverse its long-held position that marijuana be retained as a Schedule I substance with no medical value. The AMA adopted a report drafted by its Council on Science and Public Health (CSAPH) entitled, "Use of Cannabis for Medicinal Purposes," which affirmed the therapeutic benefits of marijuana and called for further research. The CSAPH report concluded that, "short term controlled trials indicate that smoked cannabis reduces neuropathic pain, improves appetite and caloric intake especially in patients with reduced muscle mass, and may relieve spasticity and pain in patients with multiple sclerosis." Furthermore, the report urges that "the Schedule I status of marijuana be reviewed with the goal of facilitating clinical research and development of cannabinoid-based medicines, and alternate delivery methods." The change of position by the largest physician-based group in the country was precipitated in part by a resolution adopted in June of 2008 by the Medical Student Section (MSS) of the AMA in support of the reclassification of marijuana's status as a Schedule I substance. In the past year, the AMA has considered three resolutions dealing with medical marijuana, which also helped to influence the report and its recommendations. The AMA vote on the report took place in Houston, Texas during the organization's annual Interim Meeting of the House of Delegates. The last AMA position, adopted 8 years ago, called for maintaining marijuana as a Schedule I substance, with no medical value. "It's been 72 years since the AMA has officially recognized that marijuana has both already-demonstrated and future-promising medical utility," said Sunil Aggarwal, Ph.D., the medical student who spearheaded the passage of the June 2008 resolution by the MSS and was one of the CSAPH report's designated expert reviewers. "The AMA has written an extensive, well-documented, evidence-based report that they are seeking to publish in a peer-reviewed journal that will help to educate the medical community about the scientific basis of botanical cannabis-based medicines." Aggarwal is also on the Medical & Scientific Advisory Board of Americans for Safe Access (ASA), the largest medical marijuana advocacy organization in the U.S. The AMA's about face on medical marijuana follows an announcement by the Obama Administration in October discouraging U.S. Attorneys from taking enforcement actions in medical marijuana states. In February 2008, a similar resolution was adopted by the American College of Physicians (ACP), the country's second largest physician group and the largest organization of doctors of internal medicine. The ACP resolution called for an evidence-based review of marijuana's status as a Schedule I controlled substance to determine whether it should be reclassified to a different schedule. "The two largest physician groups in the U.S. have established medical marijuana as a health care issue that must be addressed," said ASA Government Affairs Director Caren Woodson. "Both organizations have underscored the need for change by placing patients above politics." state-based legal envelope relevant to the medical use of cannabis; (3) provides a brief overview of our current understanding of the pharmacology and physiology of the endocannabinoid system; (4) reviews clinical trials on the relative safety and efficacy of smoked cannabis and botanical-based products; and (5) places this information in perspective with respect to the current drug regulatory framework." A war is breaking out between the Cannabusiness Community, that hopes to profit from draconian regulation of Marijuana, and the pillars of the drug reform movement that insist that the self cultivation of Marijuana become an untaxed, unregulated sacred right. The first shots were fired by a speech by Jack Herer and the firing of Dennis Peron from Oaksterdam University. Could this be our "Concord" moment? Support the true Re-Legalization of cannabis with the Jack Herer Initiative !!! 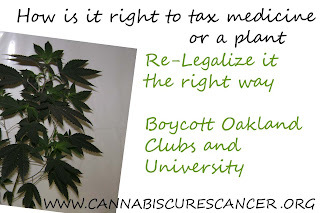 If you feel it has to be taxed the http://www.californiacannabisinitiative.org/ initiative is way better than the Tax Cannabis 2010 / from Oaksterdamn University that is all profit motivated and limits patients. 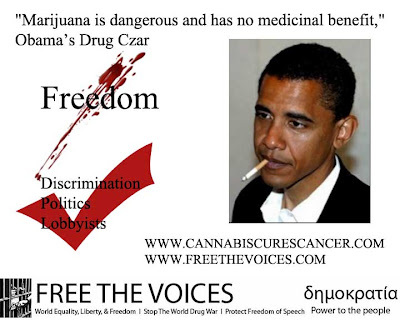 Let non violent cannabis smokers out of jail, save taxpayers $$$$$$$$$$$$. ASA NEWS LINK When will the local DA get a clue with the federal government? The best documentary of the bunch. It focuses on how cannabis helps people, instead of the negative / profit aspects. Ending federal medical marijuana raids "is now American policy"
Speaking at a press conference on Feb. 25 with DEA Administrator Michele Leonhart, U.S. Attorney General Eric Holder told reporters that ending federal medical marijuana raids "is now American policy." The Attorney General’s comments are the latest sign of a sea change in federal policy prompted by a groundswell of grassroots pressure by Americans for Safe Access (ASA) and our allies. They came as a response to Drug Enforcement Administration (DEA) raids carried out by Bush Administration holdovers in California in January and February. ASA needs your support to keep grassroots pressure on the Attorney General. Please support ASA today. President Obama indicated he would end the DEA raids during his presidential campaign, a position reiterated by the White House following DEA raids in raids which took placeon February 4. In response to a question last night about DEA raids at medical marijuana facilities in California, Holder said, "What the President said during the campaign...is consistent with what we will be doing here in law enforcement. He was my boss in the campaign....He is my boss now. What he said in the campaign is now American policy." Medical marijuana patients and advocates, who have mounted a massive grassroots campaign to influence the new Administration’s policy, cheered the Attorney General’s comments. 72 million Americans live in states where medical cannabis is legal, but federal law prohibits its use under any circumstances. More than 100 Americans are currently facing prosecution, sentencing, or serving time in prison for medical cannabis offense right now. ASA needs your help to ensure that the emerging change in federal policy signals an end to prosecutions and brings those already serving time for medical cannabis offenses home to their families. ASA has provided recommendations for a new national medical cannabis policy to President Obama and the 111th Congress earlier this year. We are working overtime now to be sure those recommendations are heard in this new era of compassionate federal policy. Please support ASA in this effort. Americans for Safe Access is the nation's largest organization of patients, medical professionals, scientists and concerned citizens promoting safe and legal access to cannabis for therapeutic use and research. Join the http://cannabiscurescancer.ning.com/ social group and help spread this info to other people. Please download and listen to this powerpoint presentation. The extent of cannabis smoking during the Colonial era is still subject to debate. President George Washington wrote a letter that contained an oblique reference to what may have been hashish. "The artificial preparation of hemp, from Silesia, is really a curiosity." 38 Washington made specific written references to Indian hemp, or cannabis indica, and hoped to "have disseminated the seed to others. " 39 His August 7, 1765 diary entry, "began to separate the male from the female () plants," describes a harvesting technique favored to enhance the potency of smoking cannabis, among other reasons. 40 Hemp farmer Thomas Jefferson and paper maker Ben Franklin were ambassadors to France during the initial surge of the hashish vogue. Their celebrity status and progressive revolutionary image afforded them ample opportunities to try new experiences. Jefferson smuggled Chinese hemp seeds to America and is credited with the phrase in the Declaration of Independence, "Life, liberty and the pursuit of happiness." Did the Founding Fathers of the United States of America smoke cannabis? Some researchers think so. Dr. Burke, president of the American Historical Reference Society and a consultant for the Smithsonian Institute, counted seven early presidents as cannabis smokers: George Washington, Thomas Jefferson, James Madison, James Monroe, Andrew Jackson, Zachary Taylor and Franklin Pierce. 41 "Early letters from our founding fathers refer to the pleasures of hemp smoking," said Burke. Pierce, Taylor and Jackson, all military men, smoked it with their troops. Cannabis was twice as popular among American soldiers in the Mexican War as in Vietnam: Pierce wrote to his family that it was "about the only good thing" about that war. Central and Western African natives were farming and harvesting cannabis sativa in North America as slaves. If they did smoke on the plantations, that would be kept secret. 42 By the time of the Louisiana purchase in 1803, New Orleans had a mixed Spanish, French, Creole, Cajun, Mexican and Black population. The city teemed with adventurers and sailors, wise to the ways of cannabis. It was mixed with tobacco or smoked alone, used to season food 43, to treat insomnia and impotence, and so on.